Heat oven to 425 degrees. Grease a baking sheet with cooking spray. Place graham crackers in a spice grinder or the bowl of a food processor, and process until a powder forms. You’ll need 2/3 cup. Pour graham flour into a large bowl. Sift flour, baking powder, baking soda, and salt over graham flour. Add butter and using a fork, cut it into flour mixture until mixture resembles coarse crumbs. Stir in brown sugar. In a bowl beat 1 egg and buttermilk until blended. Stir into flour mixture and mix until just incorporated. Stir in chocolate chips. Using your hands, lightly knead dough to form a soft, slightly sticky dough. Place dough on a lightly floured surface and shape into a round. Pat dough into a 3/4- to 1-inch-thick round. Using a floured 2-inch cutter, quickly push cutter down through dough, and lift without twisting. Place scones on prepared pan. Reshape remaining dough and repeat until all dough has been used. Beat remaining egg in a bowl. Brush tops of scones with beaten egg. Bake scones for 7 minutes. Transfer them immediately to a wire rack to cool. Make Maple Marshmallow Topping while scones are baking and cooling. Once scones have cooled, spoon a dollop of Maple Marshmallow Topping on top of each. 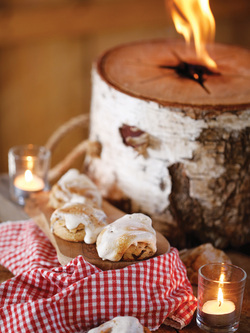 Using a hand torch, toast each marshmallow-topped scone until browned. If you do not have a hand torch, heat the broiler and broil scones until browned. Serve slightly warm. Pour 1/4 cup cold water into a small saucepan. Sprinkle gelatin over water, and cook over low heat until gelatin has dissolved, stirring constantly. Add maple syrup, and stir until combined. Increase heat to medium-high, and cook until mixture almost comes to a boil. Pour warm syrup into a deep mixing bowl. Using an electric hand mixer beat on high speed for about 12 minutes, or until doubled in volume and soft peaks form.